Today’s recipe comes from one of my favorite cookbooks in my kitchen, Betty Crocker’s Easy Everyday Vegetarian. There are many reasons for my love of this cookbook, good pictures, easy to find ingredients, in fact you may have most them in your kitchen already, the meals are fairly quick to make, and for you non-vegetarians out there it gives suggestions of how it can be converted to non-veg options. Prepare ravioli as instructed on package. Pepare spinach as instructed on package. Use cheese cloth to tie up cinnamon stick and coriander in a mini bag. 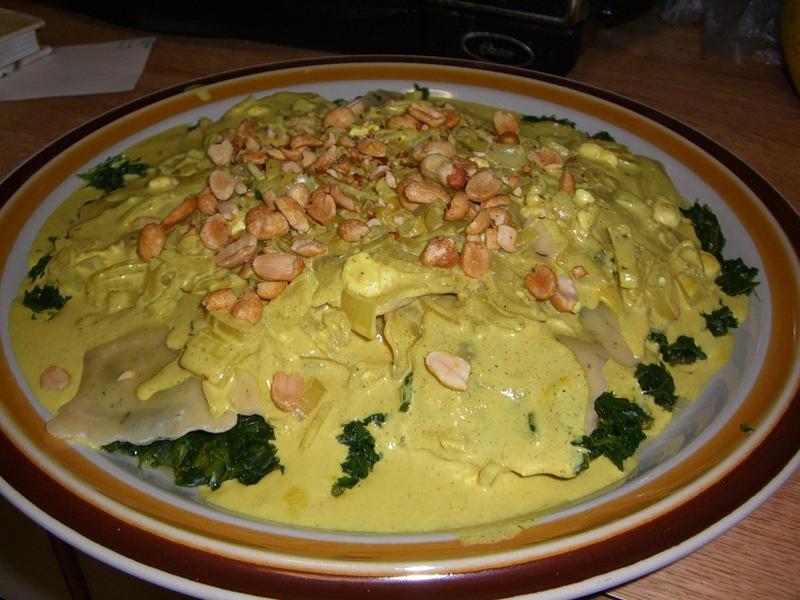 In a sauce pan mix cream cheese, vegetable broth, coconut milk, curry powder, salt, ginger and cinnamon coriander bag. Cook over medium heat until cheese is melted and let it simmer, stirring occasionally. Place spinach on bottom of serving dish, next layer ravioli, pour sauce over it all. Garnish with peanuts and onion. Heat oven to 350 degrees farhenheit. Melt 1/4 cup butter over medium heat in a sauce pan. Mix in flour, salt, pepper, mustard and nutmeg until smooth. Stir in milk, bring to a boil stirring constantly. Let boil for one minute. Stir in cheese. 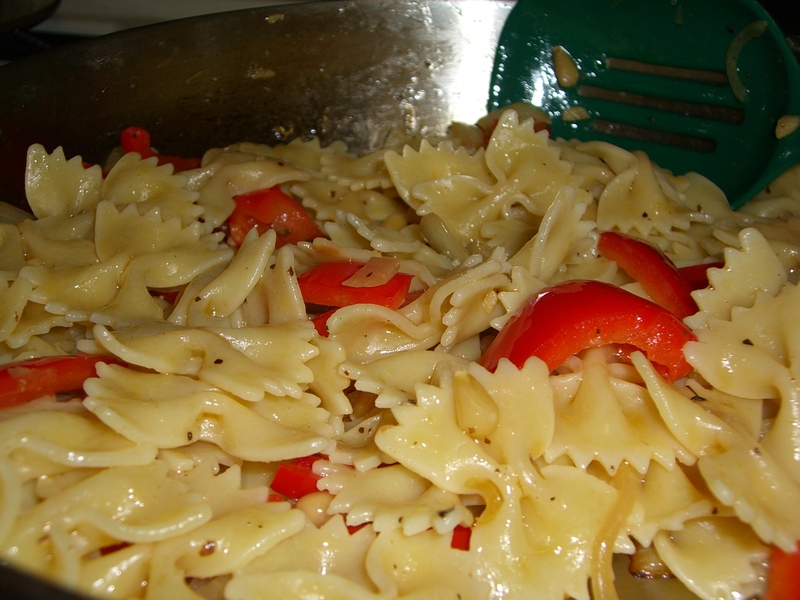 Saute garlic, onion, and peppers in a tablespoon of olive oil until onions are clear. Combine pasta, sauteed vegetables and sauce in one pot. Pour into 2 quart casserole dish. 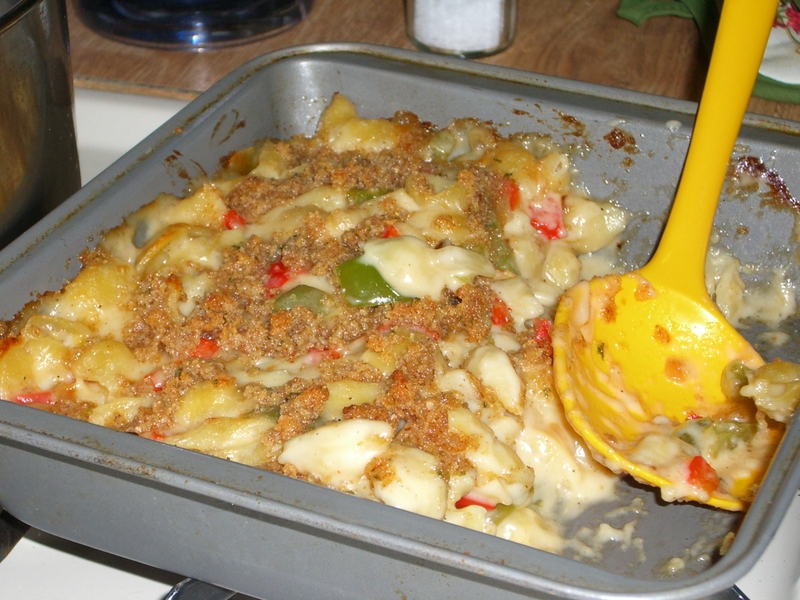 Mix melted 2 tablespoons of butter and bread crumbs. Sprinkle on top of pasta. I must think I live in the southern hemisphere because it’s summer in my apartment or at least my cooking is very summery. Lots of my cooking comes together just by looking around the kitchen and picking out things I imagine will taste good together. If you are looking for something light to eat with all this heavy winter food I’ve got the recipe for you. In a medium pan heat olive oil over medium high heat. Saute lemon peel, garlic, pine nuts and onions until onions are near clear. Add red pepper and cook until crisp tender. Squeeze juice of half of lemon in and cook to mix flavors. Toss pasta with a little bit of olive oil and sauteed vegetables. Sprinkle with basil. Sometimes the ordinary every day back of the box recipes need a little twist. For years my sister’s and I have been making the San Girogio Creamy Garlic pasta as printed on the back of the box, but tonight I took the good as it is Creamy Garlic pasta to a whole new level of yumminess! Prepare pasta as described on box. Heat oil over medium heat, saute garlic for about 1 minute. Stir in flour until smooth. Add milk and broth, heat to boiling, stir constantly until thick. Stir in Parmesan cheese. Stir in Pesto. Saute onions in a bit of oil. Add tomatos and simmer until warm. 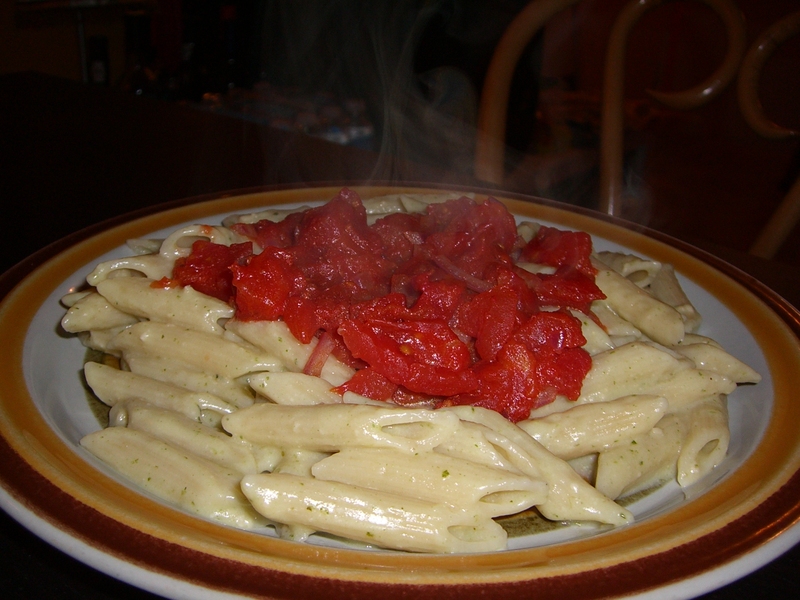 Toss sauce with pasta. Serve tomato and onion mixture on top. In the mean time chop pepper into large chunks, it roasts best when the chunks are bigger. Place chunks of peppers on a roasting pan or cookie sheet in a single layer. Use toaster oven or conventional oven and set to broil. Make sure to move the rack closer to the top of the oven. Once you toss the pasta in the pot to cook place peppers in oven. Cook on one side until spots of blackening occur, about 5 minutes. Flip to cook the other side about 3 minutes. Remove from oven and cool until you can handle it to chop into bite size pieces. Chop walnuts. Place in skillet on medium high heat. The walnuts will darken as they toast be careful not to burn them it doesn’t take much. Toss cooked pasta and about 1/4 of pesto sauce, just enough to coat the pasta. Sprinkle with feta crumbles, walnuts and pepper. I would guesstimate 3 servings. In food processor or blender mix all the ingredients on medium speed until smooth. It’s really that simple! You can make this in advance. Seal it tightly and save it in your refridgerator for 5 days or freeze for up to a month. 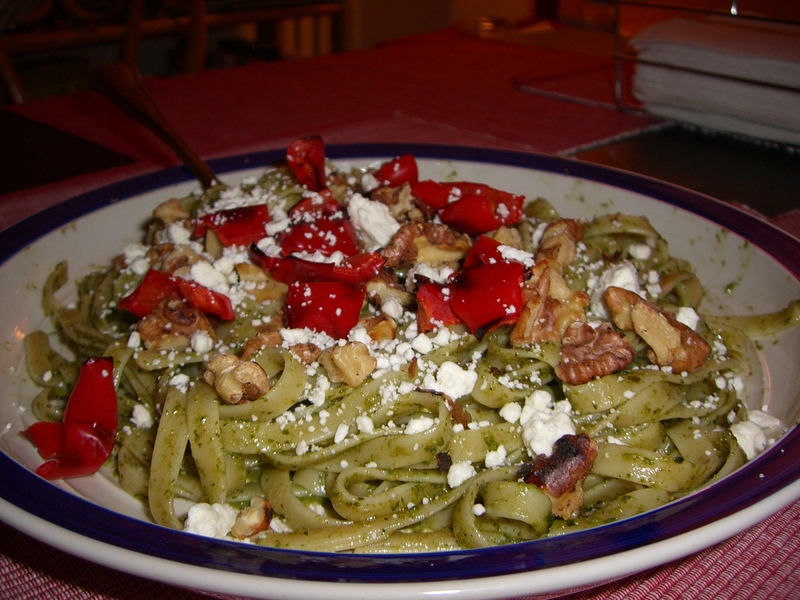 Darkening of pesto during storage is normal.